Instead of burgers made with ground beef, McDonalds offers burgers made with paneer cheese, chicken, fish, and veggie patties. McDonald’s is the largest restaurant chain in the world next to Subway, also a presence in India. But in its way, McDonald’s with its bright red storefronts and two storey billboards keeps a higher profile than the ubiquitous but more modestly marketed Subway stores. McDonald’s was created by American entrepreneur Ray Krock who bought a hamburger stand that served the now iconic American menu items – hamburgers made with ground beef, French fries, and milk shakes. Ray Kroc used this initial restaurant as a template for a chain of restaurants across the country. Other restaurant entrepreneurs could buy into the business, operating their own McDonald’s stores that replicated the menu, customer service, and mission statement of the original store. Over the past half century McDonald’s became a model for the franchise system spawning a trend in chain restaurants and retail stores that offer the same products, but were managed by an army of owner operators first across the United States, and then across the globe. Global franchises present a challenge for the franchise model because tastes differ across countries and cultures. McDonald’s prides itself on maintaining consistency of its food. As their Executive Chef says, a food item must taste the same in the test kitchen as it does in Alaska. But between borders McDonald’s have varied its menu to accommodate the tastes and cultural sensibilities of residents in countries around the world. The food may differ from country to country, but McDonald’s iconic clown mascot remains the same. 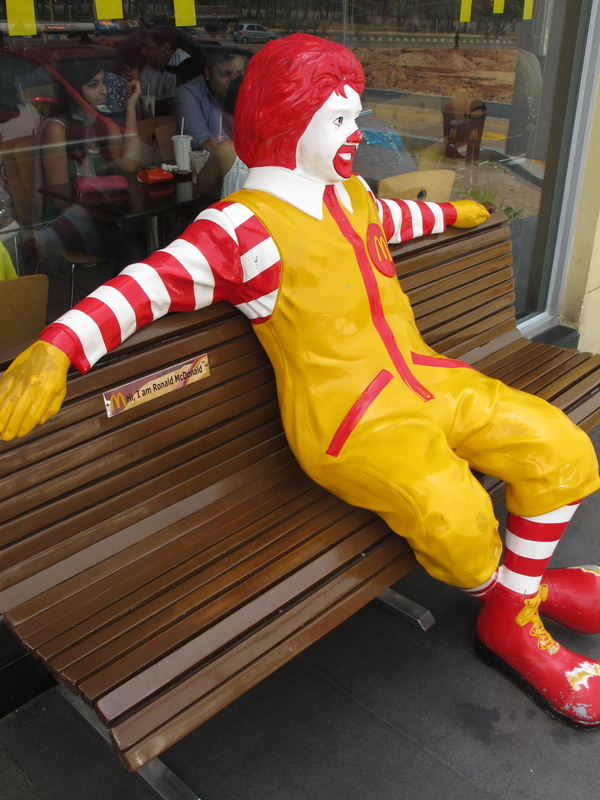 Here he is seated on a bench at a McDonald’s outside of Bangalore. Food is one of my favorite cultural experiences, and while I can’t say that fast food is my favorite cuisine anywhere, it offers an interesting perspective on a culture. India is no exception and McDonald’s serves as an interesting gauge for analyzing cultural trends anywhere. I have seen tiki masala lamb burgers in North Ireland ten years ago when the UK identified Indian food as its most popular cuisine and a quick scan of McDonald’s global menus reveals a pandering to local tastes such as a Parmigiano Burger in Italy, which is served on a rustic ciabatta bun with lettuce, tomato, a cheesy mayonaise and a generous slice of its namesake cheese. In Greece the menu includes a Shrimp Burger and the gyro like Greek Mac, both pandering to local palates and cultural sensibilities (Greek orthodox Catholics will not eat meat on Fridays but will eat seafood). If you wikapedia McDonald’s international menus, you may find as I did that Poland, of all places, may show the most innovation with the McDonald’s menu. 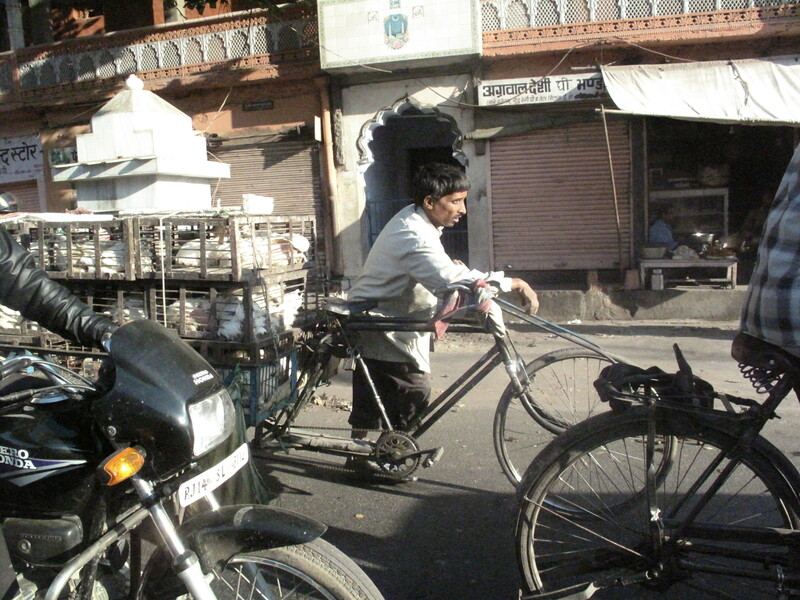 In India, where it is taboo for Hindus to eat beef (the essential ingredient in hamburgers the world over) and the population of vegetarians is easily twice the entire populations of the United States, the menu is very different from it’s American counterpart, but the color scheme, customer service, and junk food appeal remain largely the same. 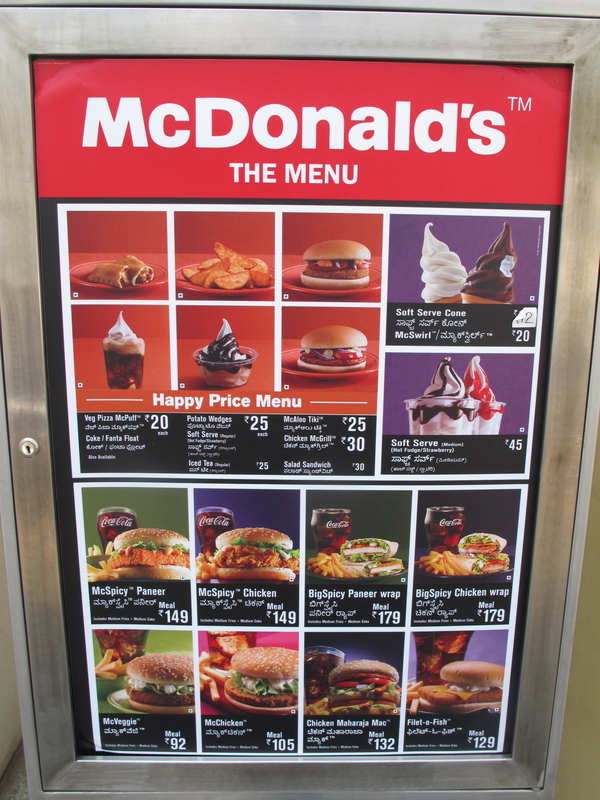 The complete McDonald’s menu at a restaurant in India. McDonald’s offers a wide array of sandwiches that are still fondly referred to as hamburgers by the locals, but made without beef. 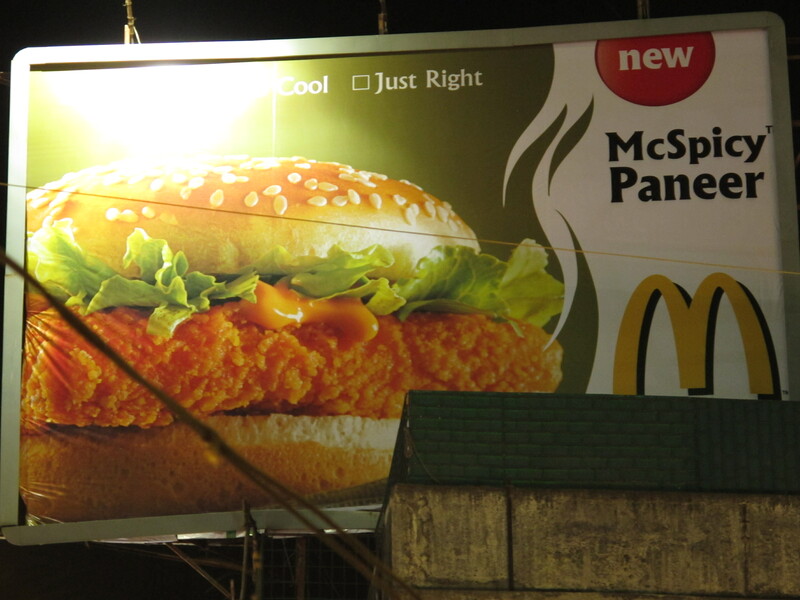 McSpicy Paneer or McSpicy Chicken sandwiches were being heavily advertized this spring and vegetarian burgers, fish sandwiches, and a paneer wrap are also on the menu. Hindus may not approve of beef hamburgers, but fried foods are widely loved by all people in India and McDonald’s has no problem capitalizing on everyone’s fondness for fried street food, with fried potato wedges, chicken nuggets, and fried veggie or potato patties like the one in McAloo Tiki. The Chicken Maharaja Mac replaces the American Big Mac as the gut buster on the menu. 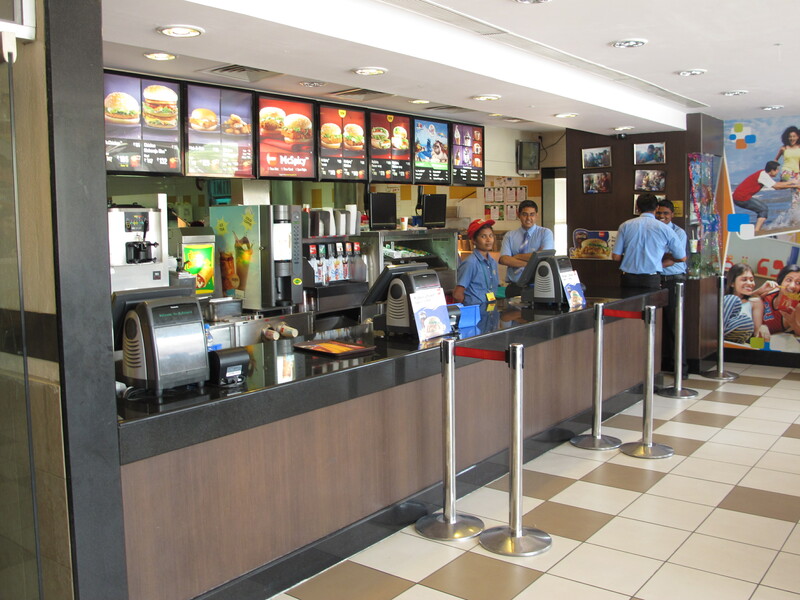 The food may be different, but on the outside a McDonald’s restaurant often looks the same anywhere in the world. 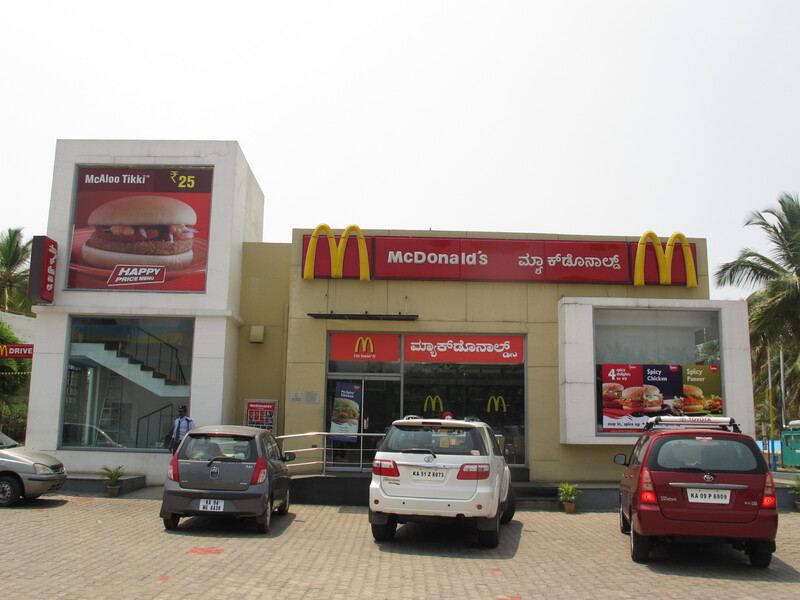 This is a McDonald’s in Southern India near Bangalore. Inside a McDonald’s in India. Even though Hindus will not eat beef, an increasing number of Hindus are leaving their vegetarian lifestyle behind and eating chicken and mutton (either sheep or goat). This is partly because of the increasing affluence of more people in India as well as the tendency to adopt more Western customs. This means that more chickens are being grown to meet the demand for meat and that more people are experiencing the health problems that come with eating meat. Chicken is not a red meat, but it is not necessarily a healthy meat, especially because the way chickens are raised and sold are stressful on the animals and therefore the animals have more stress hormones in their meat as well as more cholesterol. There are more and more processed foods available in grocery stores and roadside kiosks and as Indians eat more store bought processed food the incidence of diabetes and gluten allergy has skyrocketed. It is interesting to note that in the United States, diabetes and obesity is a problem for the poor – because fast food and processed food is the most affordable food, where in India diabetes and obesity is a problem for the rich and the growing middle class. These are the people that can afford to eat at the growing number of fast food restaurants around the nation. These are also the people that want to emulate the American lifestyle, for better and for worse. You often seen white feathered fryer hens being sold or transported in these in individual cages, so small there is no room for a chicken to stand up. Underneath this burlap sack cloth are live chickens for sale kept in the same individual cages as above. 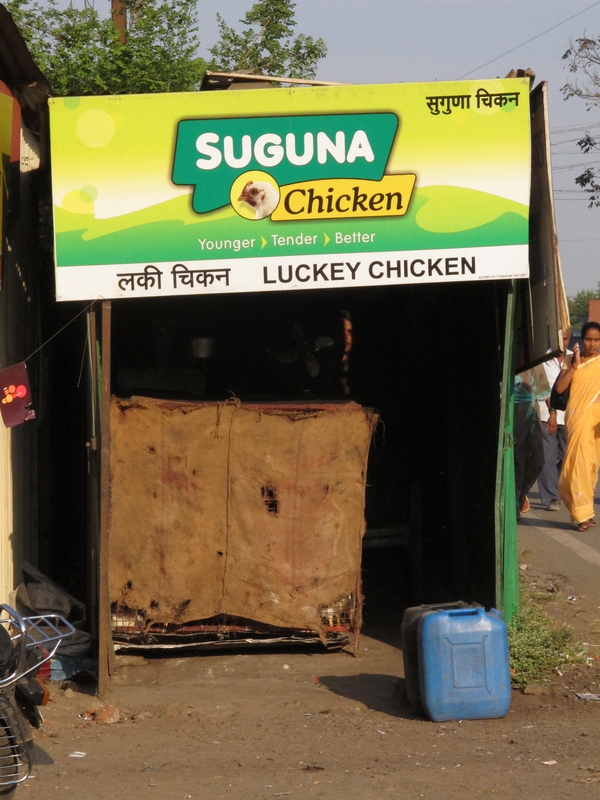 This company’s slogan is “Luckey Chicken”, though I doubt the chickens feel that way. 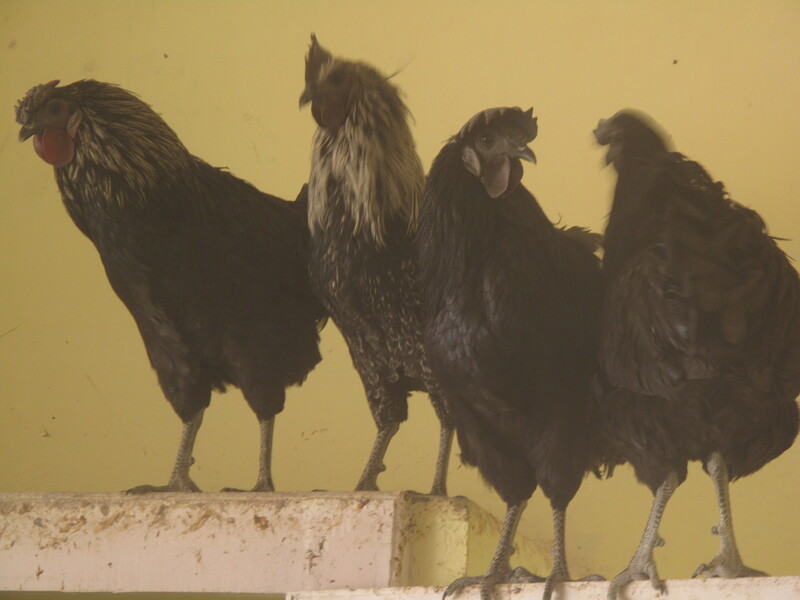 Because white fryer chickens are universally used in restaurants in every city in India, these native black-pigmented chickens are only rarely found in village farms these days. These chickens were being raised at a veterinary college outside of Jaipur where students raised rare and endangered breeds of native poultry. This entry was posted in India and tagged Animal Welfare, Chickens, Fast Food, Food, Health, McDonald's, Ray Kroc. Bookmark the permalink. McDonald’s still don’t sell veggie burgers in their USA fast food joints. I was in Australia and New zealand in the early 1990s and seen that they were selling veggie burgers there! They were using lard for many many years in frying the potato strips (“french fries”) and lately have changed to a cooking oil without any lard in it. However, chemicals are added to this oil to pervent foaming and some thing else while the potato strips are fried!! Thank you for reminding everyone about McDonald’s beef lard scandal, certainly an unwelcome and unfortunate event for Hindus and other vegetarians that enjoyed McDonald’s french fries. It is strange that McDonald’s has not yet offered a vegetarian sandwich option on their U.S. menu. Maybe they think Americans prefer salads? There was an article recently that the salads are not popular and only a small fraction of McDonald’s sales but they would still retain it in the menu for publicity sake (“healthy food”). I’m One among many Hindus that are craving to get some of them cheeseburgers like we get at McDonalds’ outside the country. Excellent essay! I would have liked to have been there for the opening of the first McDonald’s in India. I also found it particularly interesting that “…in the United States, diabetes and obesity is a problem for the poor – because fast food and processed food is the most affordable food, where in India diabetes and obesity is a problem for the rich and the growing middle class.” This is certainly worthy of more reflection! Thanks for your comment. If you would like to understand more about why processed foods are the most affordable foods in the United States, I recommend watching the “Food Inc.” documentary. It is full of important information everyone should know about industrial agriculture and their food. Also the book, “Stuffed and Starved” by Raj Patel is worth looking at. There’s certainly a lot to find out about this subject. I really like all of the points you made. Nice post! True on many accounts, except that my Indian family (and in India) has always eaten non-veg (as is a big chunk of our population). And we dont call them hamburgers (infact our hamburgers have ham in them); just burgers.